In conjunction with the conference, the SCAD Library will be presenting a special exhibition, “Behind the Cels: Selections from SCAD’s Don Bluth Collection,” featuring art work donated to the school by Don Bluth and Gary Goldman; Goldman will introduce the exhibit during the conference on Saturday, July 11th, and will also be present at a free reception, which is open to the public, Thursday evening, July 9th, from 6:00-8:00 pm. Finally, ASIFA-Atlanta, in conjunction with the High Museum of Art, is organizing “Georgia Animation on Our Mind: A Retrospective of Peachtree State Animation,” which will screen at the nearby Woodruff Arts Center’s Rich Auditorium. The program features short animations, including experimental shorts, TV commercials and Avery Matthews, a never-aired Cartoon Network pilot. For details on the conference, including registration fees, check out the conference blog at http://blog.scad.edu/sasc. You can also sign up for free tickets to the Friday night screenings at the ASIFA-Atlanta website, http://www.asifa-atlanta.com. Anthony Balducci has written a great (and lengthy) piece talking about the combination of comedy and pathos, using many examples from a variety of comedians and films. 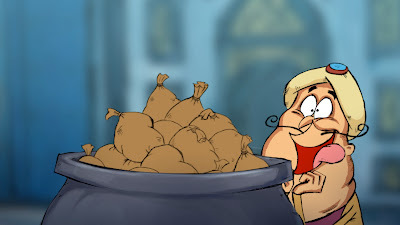 While no animated films are discussed, the combination is certainly present in animated films and the pitfalls that Balducci discusses frequently show up. If you heard that a political candidate was supported by 11% of the electorate, would that impress you? If 11% of people chose a particular toothpaste, would you change your buying habits? How about if 11% of the members of the Academy of Motion Picture Arts and Sciences selected a film as Best Picture. Should it win? The Academy has decided to expand the number of Best Picture nominees from five to ten. The Academy has been unenthusiastic about nominating films that do the best box office. The Best Picture nominees are films that only a minority of movie goers have seen. As a result, the Oscar telecast suffers in the ratings as few people watching know the films being considered. By expanding the number of nominations to ten, the studios hope that films that gross more than $100 million have a chance to get a Best Picture nomination. The public doesn't know how many votes a Best Picture winner receives. The numbers are as closely guarded as the votes in an Iranian election. Right now, it's possible that the winner receives 21% of the vote, which is still pretty flimsy. Doubling the number of nominees makes it less likely that a majority of the voters will choose the same film. Will this be good for animated features? I suppose that with 10 slots, it's more likely that an animated film will get a Best Picture nomination. You can be sure that Disney/Pixar and DreamWorks will lobby hard for the chance. However, the Academy voters have already shown their indifference to animation the same way they've shown their indifference to big box office. We'll have to see what the Academy nominates next year. While the studios are hoping for more mainstream nominations, the Academy may not cooperate. Even if it does, splitting the votes among more films is liable to produce a result that nobody is happy with. Updated with a new link at the bottom. 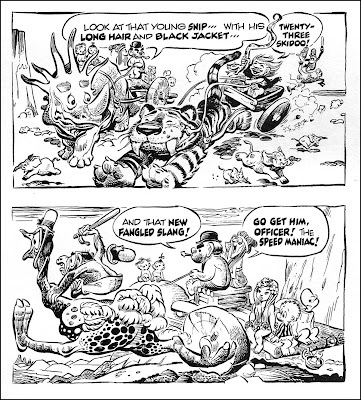 Walt Kelly started his career on the east coast in early comic books, pre-Superman. He then shifted to working at Disney, where he was initially in the story department and later moved to being an animator. His credits include features like Pinocchio, Dumbo and The Reluctant Dragon and shorts like The Nifty Nineties. He left Disney at the time of the strike and returned to the east coast, where he spent the bulk of the 1940s creating comic book stories for Dell comics of various kinds. 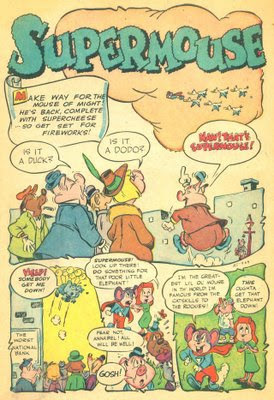 One of his strips in Animal Comics developed into Pogo. Starting in 1948, Kelly went to work for the New York Star as an illustrator and art director. He took Pogo along with him as a comic strip. When the Star folded, Pogo found a home in syndication and continued beyond Kelly's death. In 1966, something happened to Kelly to cause him to send his characters to Mars (though it turned out to be the Australian outback). Perhaps it was boredom or perhaps Kelly was inspired by something, but the 14 month sequence in Prehysteria became the artistic highlight of his time drawing Pogo. The setting allowed him to create fantasy characters and landscapes more elaborate than anything he'd previously done in the strip. Thomas Haller Buchanan, with the help of Ger Apeldoorn, has created a blog that intends to reprint the entire sequence (with some related sidetrips). The place to start is at the bottom of this page and continue upwards. Kelly is not to everyone's taste. However, even if you don't share his sense of humour or interest in politics, you have to admire his cartooning chops. His use of the brush is universally admired by cartoonists and his poses are highly influenced by animation, using a character's whole body to communicate the character's emotional state. If you are unfamiliar with Kelly's work, I urge you to take a look. The Worldwide Short Film Festival is currently running in Toronto. 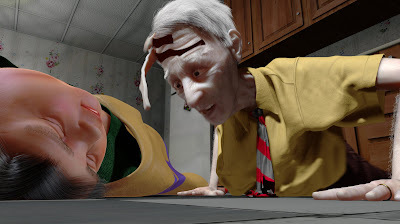 I attended a program today that included Chris Landreth's new film, The Spine, as well as the latest Wallace and Gromit half hour, A Matter of Loaf and Death, directed by Nick Park. Both films are consistent with their creators' previous work. Landreth's approach to animation is a sort of German Expressionism. While the German films of the 1920s expressed their characters' emotions through their surroundings, Landreth uses the characters' own bodies as expressions of their mental and emotional states. This film has to do with a marriage, where the partners are deformed in ways that relate to their experiences and needs. The problem with this approach is that it requires that the characters be tormented in some way, and that makes each Landreth film an appointment with dysfunction. In addition, Landreth is more enamored of technique than he is of character. The husband and wife each have their own Rosebud, something that explains their mental and physical distortions, but the result is somewhat schematic. Landreth's previous film, Ryan, is superior because Ryan Larkin was complex enough to justify Landreth's technique. Larkin is far more interesting than any character that Landreth has created from scratch. 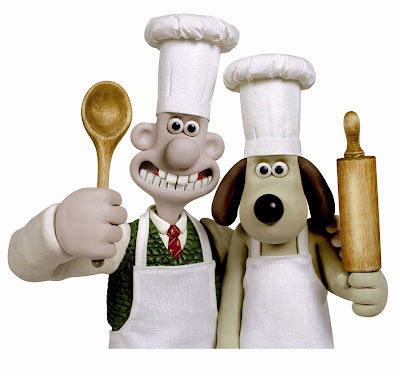 Wallace and Gromit function the same way as classic comedy teams. Once a team's personalities are established, they are placed into different settings or occupations as the only way to add variety to their endeavors. The Marx Brothers were on an ocean liner, at a college, at the opera, at the races, etc. while remaining true to their characters. The Three Stooges spent time as bootleggers, exterminators, firemen, riveters, census takers, etc. while slapping each other silly. This time, Wallace and Gromit are bakers and they are surrounded by the expected mechanical gadgetry, a dastardly villain and a slapstick climax. Once again, Wallace is a fool for love and blind to the threats that face him. Gromit, as usual, is smarter than Wallace and does what he can to protect Wallace from harm. I think that The Wrong Trousers is still my favourite of the W&G half hours, but this one is satisfying. Wallace and Gromit have not hit a new peak, but neither have they disappointed. Having graduated to features with The Curse of the Were-Rabbit, it's nice to see them in a short again. Aardman is right to maintain that flexibility. Regardless of length, Wallace and Gromit continue to uphold the tradition of slapstick comedy. For those of you in Toronto who would like to see these films, the program I saw today will be repeated on Friday, June 19 at 7 p.m. at the Cumberland Cinema, on Cumberland near Avenue Road. 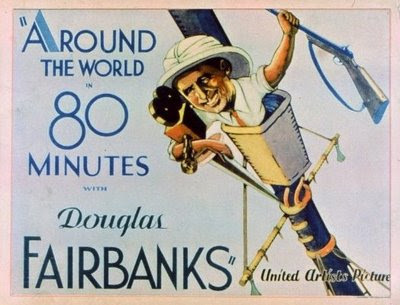 I am reading Victor Fleming: An American Movie Master by Michael Sragow, and Sragow discusses Around the World in 80 Minutes, a 1931 documentary starring Douglas Fairbanks and directed by Fleming. What's interesting is that the film apparently contains an original animated segment with Mickey Mouse. There is no mention of this in Disney biographies by Bob Thomas, Neal Gabler or Michael Barrier. There's no mention of it either in Leonard Maltin's Of Mice and Magic or Barrier's Hollywood Cartoons. Here's what Sragow has to say about this film. While Fairbanks and company visit Siam, they watch a performance of a classical Siamese dance troupe; Fairbanks says that the rhythm beneath the exotic moves and music is the same as the fox-trot, then tries to demonstrate that notion by twirling a Siamese gal around a ballroom. Out of nowhere, he announces, "Now, here's Hollywood's most famous star dancing to Siamese music. C'mon, Mickey!" The film turns into a cartoon and Mickey Mouse prances out from a doorway on the right side of the screen. Against a temple backdrop, the mouse pulls off a mix of traditional Oriental choreography and American folk dancing. His hands try to pull off elegant courtly gestures, but his feet can't help tapping or clogging. He slants his eyes for a second or two, in a mixture of frustration and homage -- no slur intended, all in good fun -- then does a series of keep-on-truckin' clogs that would make R. Crumb proud. It's a genuine novelty: the rarest Mickey Mouse cartoon. How it ended up in Around the World in Eighty Minutes remains anybody's guess. United Artists (of course) released the movie, and UA had agreed to distribute Disney's cartoons after the animator had fulfilled his still-running contract with Columbia. But no Disney cartoon received an official UA release until the summer of 1932; Around the World opened in December 1931. And Disney kept no record of any contract or correspondence between him and Fairbanks. Disney must have known that Fairbanks and Fleming were big fans of his. By then Doug had told the press that only Mickey Mouse fully exploited the capacity of the sound film: "These cartoons get their tremendous appeal from the perfect rhythm, in comedy tempo. of the little characters and of the accompanying sound. It is not merely synchronization; it is more than that; it is a rhythmic, winging, lilting thing, with what musicians call the proper accent-structure." So Disney might have simply done Doug a favor and cooked up that Mickey cameo for a renowned, vocal supporter. Barrier's The Animated Man: A Life of Walt Disney reports that Disney signed with United Artists in December of 1930, so while Around the World in 80 Minutes predates the start of releasing his cartoons through UA, the deal was already in place at that time. Furthermore, my assumption is that because the animation was included in a feature, it fell outside the shorts distribution contract that Disney had with Columbia, as did the animation in MGM's Hollywood Party, made while Disney was releasing through UA. The Museum of Modern Art has a print of Around the World in 80 Minutes and there is another copy at the Library of Congress. To the best of my knowledge, the film is not available on VHS or DVD. Has anyone seen this sequence or have more information to add? UPDATE: You can read more about this clip thanks to Didier Ghez and JB Kaufman. UPDATE 2: If you want to see the animation from the film, go here. 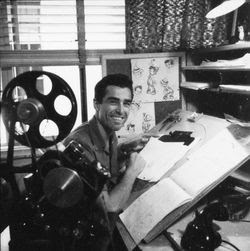 Jack Bradbury worked at Disney from 1933 to 1941, starting as an inbetweener and working up to animator on films like Ferdinand the Bull, Pinocchio, Fantasia and Bambi. Laid off after the Disney strike, he later spent a few years animating for the Friz Freleng unit at Warner Bros. However, he is probably best known for his work as a comic book artist. Starting the 1940's, he produced thousands of pages of comic book art, writing many of the stories himself. His son, Joel, has set up a website that's an archive of over 1300 pages of Bradbury's comic book work. The site also includes other artwork, such as sketchbooks and gag cartoons. One of the highlights of the site for those interested in animation history is an unpublished memoir by Bradbury about his time at the Disney studio. "My years at Disney's developed what talent I had, into a drawing skill that enabled me to make a living with it, something I had always hoped I could do, and something for which I shall always be grateful to Disney's. They made it possible for me to animate, not only on Disney pictures, but on Bugs Bunny for Friz Freleng at Warner's as well. And later to do the comic books I drew for so many, many years. At the same time, however, I do not regret for one moment, having left Disney's when the situation became too unpleasant to live with. Had I stayed, I might have become a better animator and enjoyed a nice retirement pension, something I do not now have. But life has its little trade-offs. With the Disney job and its retirement fund, came much stress and often ulcers for many. At Warner's and for years later doing comic books, I did not get retirement pay, but I did get a less stressful, more healthy and certainly happier way of life. I chose the latter because it suited me best." This Tuesday at 7 p.m. (and repeated on Wednesday at 9:30 p.m.), a selection of this year's films by Sheridan animation students will be running at Toronto's Bloor Cinema. The program runs approximately 90 minutes and admission is only $5. You can see a trailer for the program here and a list of the films here. Below is a map of the Bloor Cinema's location. Slate has an article on this year's E3 conference and the state of the gaming industry. "To the extent that games provide consumers with engaging interactive entertainment for $60—sometimes 100 hours' worth as in the post-apocalyptic Fallout 3—it's an industry that deserves to fly high in the recession. But the game industry has fired nearly 12 percent of its work force since last July (8,450 folks), according to Wanda Meloni, an analyst at M2. There may be more to come, too. Beyond closing 13 game-development studios, video game publishers are tightening their belts while, at the same time, desperately trying to show how extravagant they can be by spending millions on parties with famous bands, fancy convention booths, and movie-award-like press conferences at E3, the lavish yearly games convention in Los Angeles that's more like a boisterous, barker-filled state fair midway than a business gathering." That layoff percentage above implies that the gaming business recently employed over 70,000 people. Not all of those would be artists, but has the gaming industry surpassed features and TV series as the largest employer of animation artists? Michael Sporn, Keith Lango and Michael Barrier have all written posts expressing their reservations about Pixar's latest feature. All are articulate and their criticisms are worth considering.